Snuggling together on a floating lily pad, Maxine and Mackinzie Mouse sail off to sweet dreams. The adorable couple is perched comfortably among pretty pink flowers, and a close look reveals a sweet, little stowaway—Lydia Ladybug! 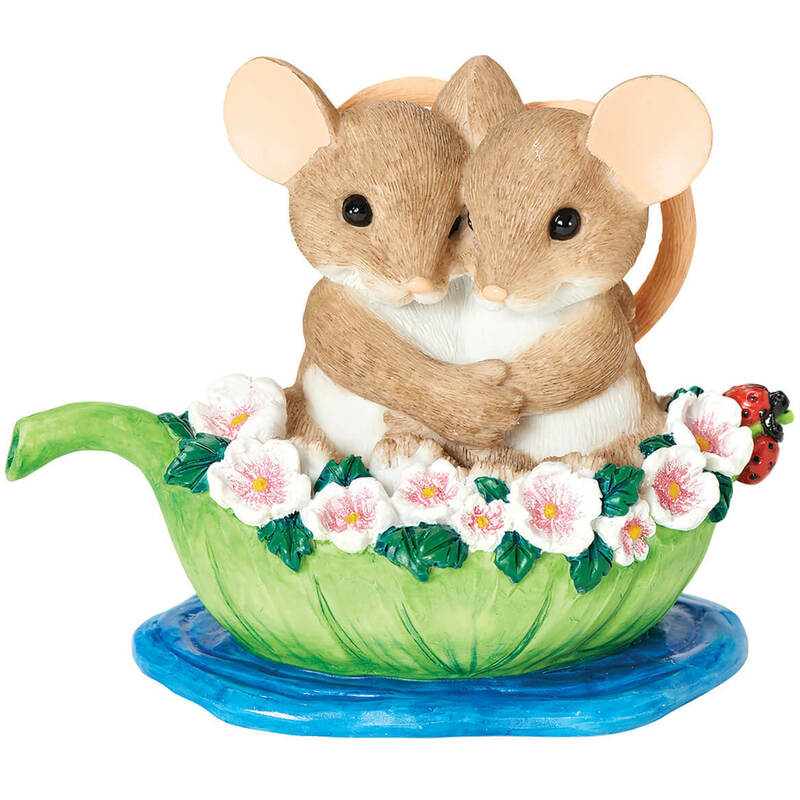 Artist Dean Griff’s Charming Tails® “Together On a Sea of Love” resin sculpture is lovingly detailed in handpainted stone and resin, lending a touch of romance and whimsy to any home or collection. 2 3/4″ high. School Years collage frame captures the memories for a lifetime. This school years picture frame features a collage mat with 12 openings for kindergarten-junior year wallet photos and a 4″ x 6″ opening for a senior picture. Some spaces carry inspirational verses. 11″ x 14″ wood frame has natural finish, glass front, and hanging hooks. Display your memories in picture-perfect style! Our Memories 10-opening hanging photo collage holds 10 photos to create a collage of your favorite times. Ideal for family photos or celebrating a special occasion such as a retirement, graduation or wedding. Photo frame measures 29″ x 14 1/2″ and features 2 triangle hooks for easy hanging. School Years collage frame captures the memories for a lifetime. 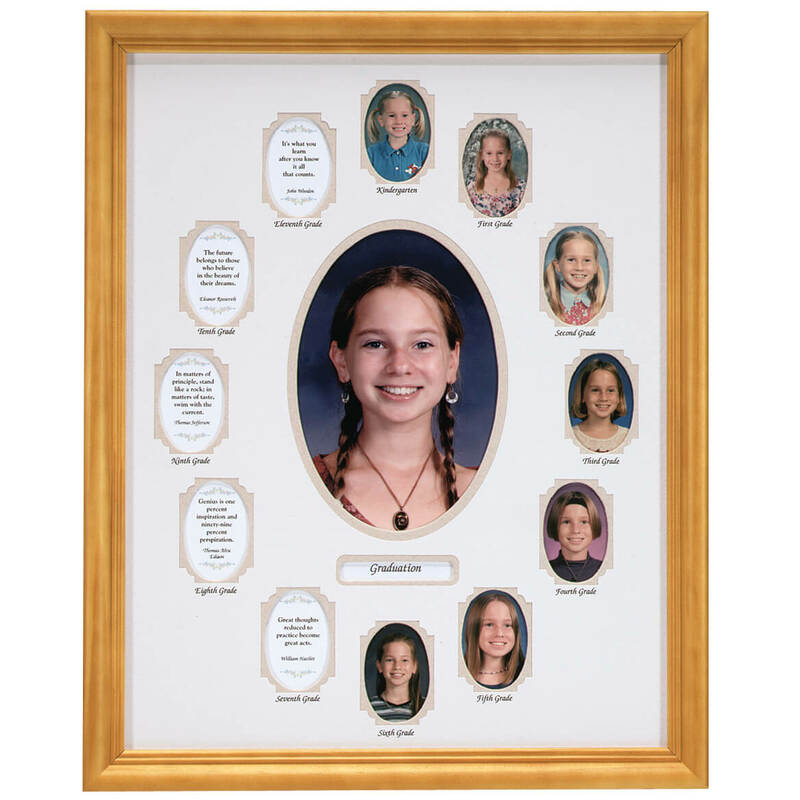 This school years picture frame features a collage mat with 12 openings for kindergarten-junior year wallet photos and a 4″ x 6″ opening for a senior picture. Each space carries an inspirational verse. 11″ x 14″ wood frame has natural finish, glass front, and hanging hooks. No beans about it … this metal coffee cup wall art set is the decorative “pick-me-up” your kitchen’s been craving. Wonderfully detailed from rising steam to scrolled handles, the brown metal coffee wall art offers versatile display, arranged to suit your style or space. Fun for any coffee lover on your gift list, the set of 3 includes Latte, Mocha and Java—value priced, as an added perk! Each 7″ wide x 8″ high cup includes sawtooth hanger. Coffee lovers shop smarter when they steal this deal—the 4-pc. 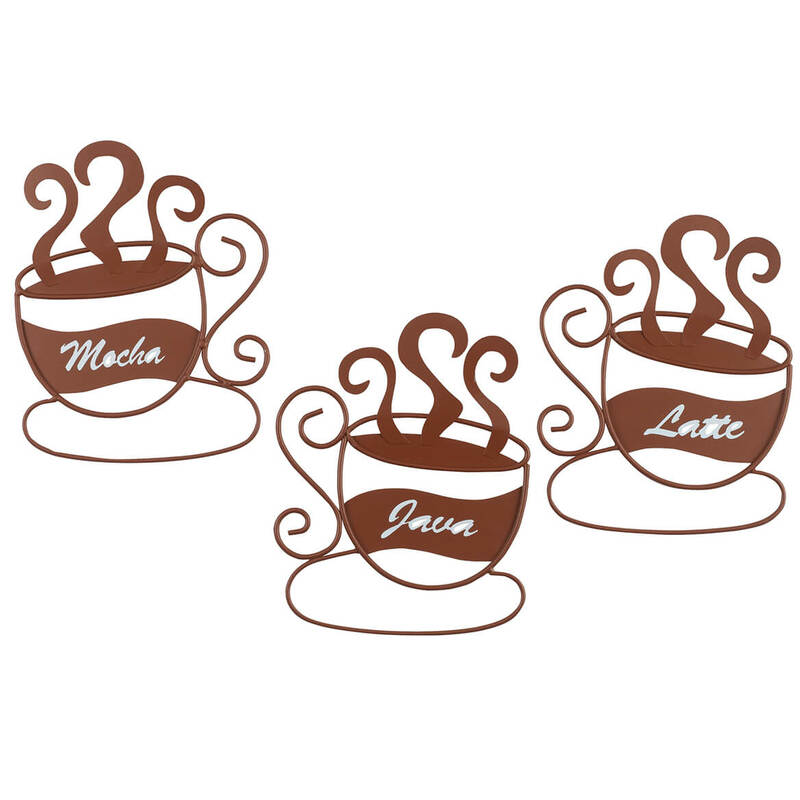 metal coffee cup decor value set makes our “bean counters” jittery! 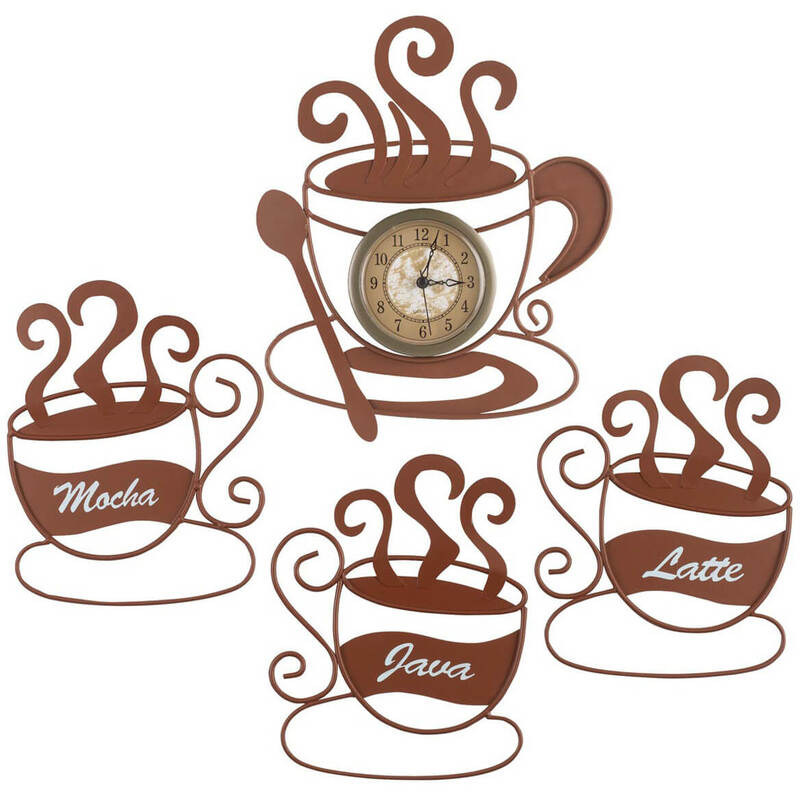 Metal wall art set includes coffee cup wall art trio featuring Latte, Mocha and Java—plus our fun coffee cup clock. Each decorative coffee wall art piece includes a sawtooth hanger for easy display. Coffee cups: 7″ wide x 8″ high each. Clock requires 1 AA battery (not included), features 9 1/2″ long x 11 1/4″ high frame with 10″ dia. clock face. Adding interest and dimension to your home’s décor, this wine glass wall hanging adds a unique touch that makes any space feel welcoming and beautifully finished. 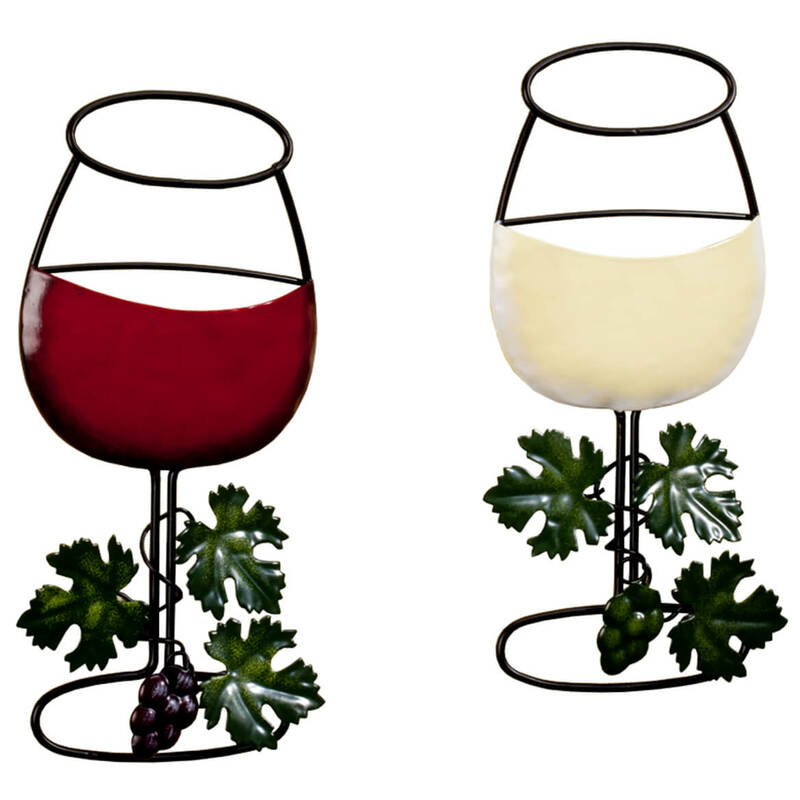 The wine decor features a lovely red and classic white—both intricately detailed in metal, with grapevine embellishments for added style. Beautifully coordinating with our Wine Wall clock (sold separately), each piece of wine wall art includes a hanging hook for easy wall display. Set of 2. Each, 4 3/4″ long x 9 3/4″ high. 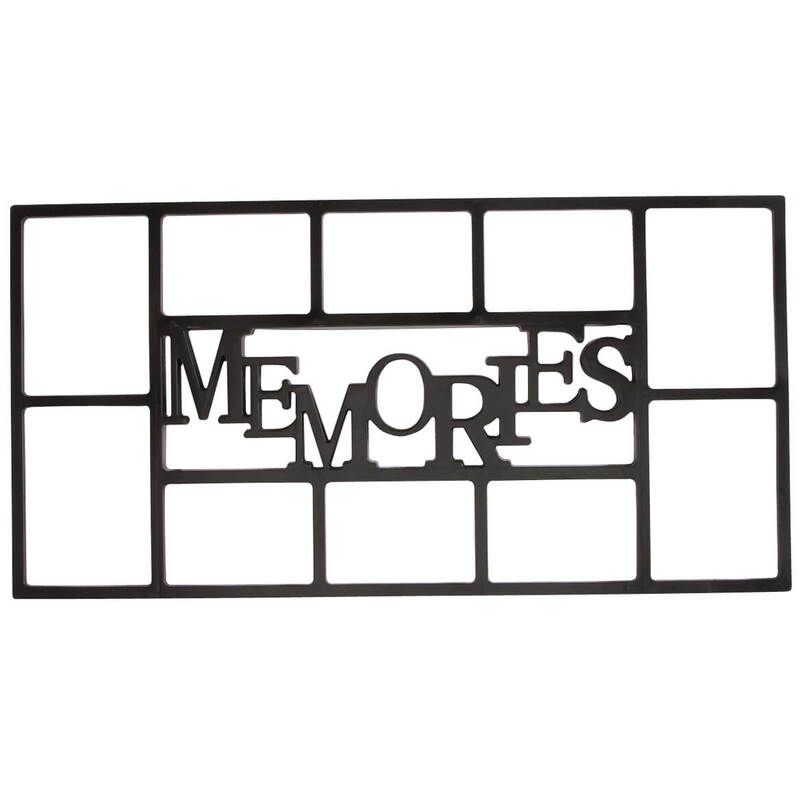 Show off a favorite photo of an important milestone with this personalized metal photo frame. The rectangular Boston frame has a bright chrome finish that adds shine to a shelf or wall. The timeless, versatile style fits with any decor. Personalized on the top and bottom, it’s perfect for commemorating a graduation, new baby or other significant life events. Makes a fantastic gift idea. Holds an 8” x 10” photo. Vertical or horizontal display. Table or wall display. Personalize with 4 lines, up to 20 characters per line (2 lines on the top, 2 lines on the bottom). 4 x 6 frame measures 7 3/4″ x 5 3/4″. 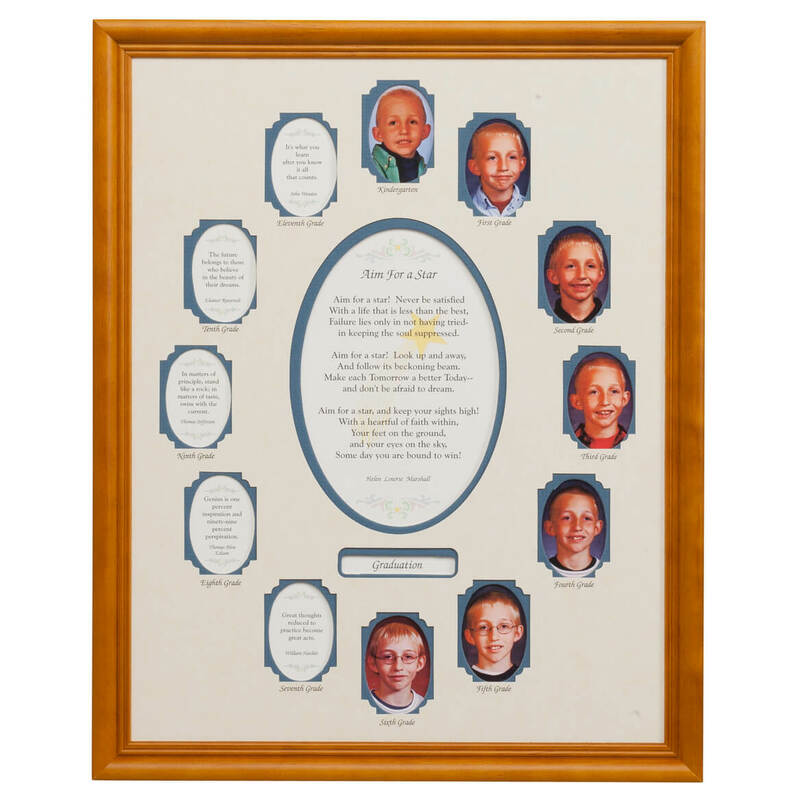 5 x 7 frame measures 9 1/2″ x 7 1/2″. 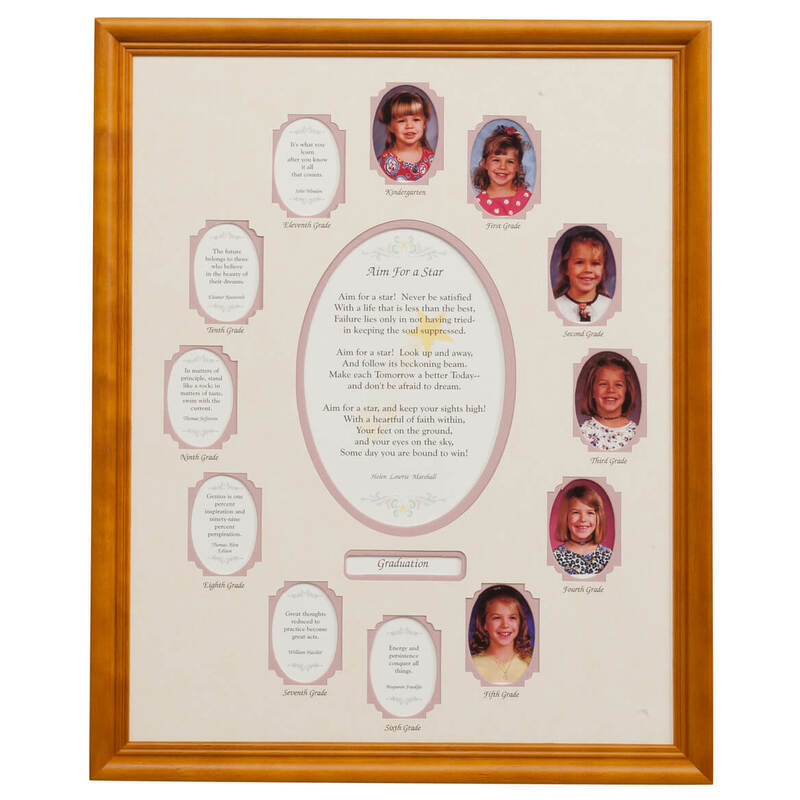 8 x 10 frame measures 11 1/4″ x 13 3/4″. This beary proud teddy is waiting and ready … to honor one graduate in personalized style! 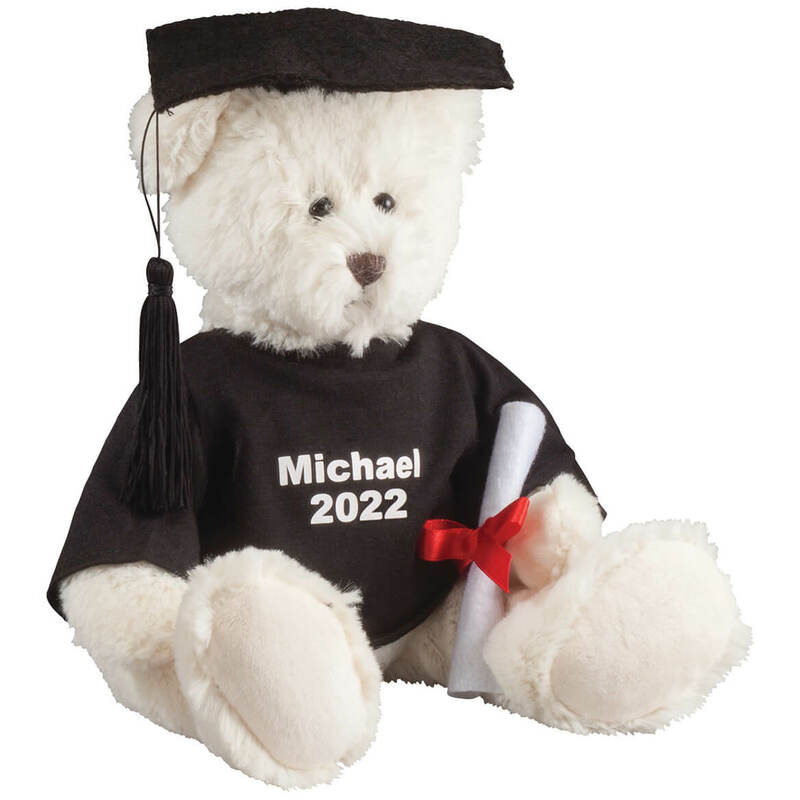 Complete with a black tassled cap and little diploma, our personalized graduation bear is a fun gift for any graduation, from kindergarten to middle school, high school or college. We’ll personalize his little black shirt with your favorite graduate’s name and special year or message, creating a custom treasure. Specify personalization; limit 2 lines, 10 characters/spaces each. Teddy bear made with 100% polyester; spot clean. 5″ wide x 8″ high in sitting position. SMALL PARTS. Not for u003c 3 yrs.